Modest losses were not unexpected given the sequence of gains. The S&P made a pitch perfect rebuttal off channel resistance. Bulls may try and repeat the action of January and February, when the index bounced along the upper resistance line. The Nasdaq pinned a doji on higher volume. However, the index remains above a former ascending resistance line (turned support). 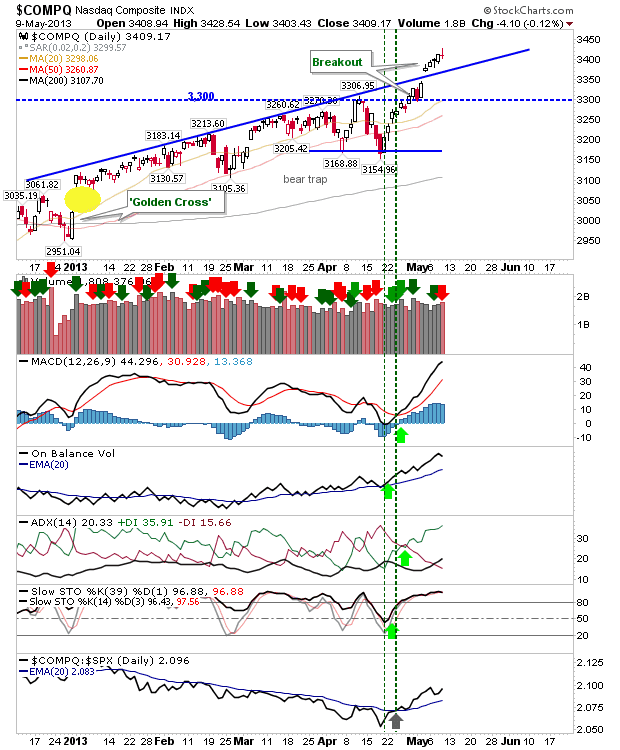 Increased volume has more in common with churning, than direct distribution, but bulls are likely to see a retracement and test of the new support line, if not the 20-day MA. 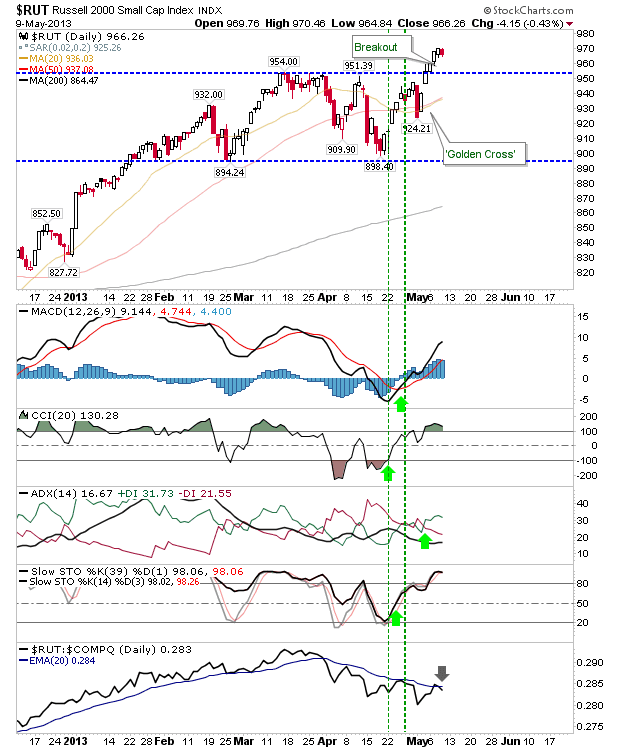 The mid-April rally hasn't had opportunity to pause and consolidate, so now may be the time. This will also be an opportunity to test the resolve of the breakout in the Russell 2000. The relative loss against the Nasdaq suggests selling will hit Small Caps harder than other indices. This will likely make it the first index to test breakout support (of 954). 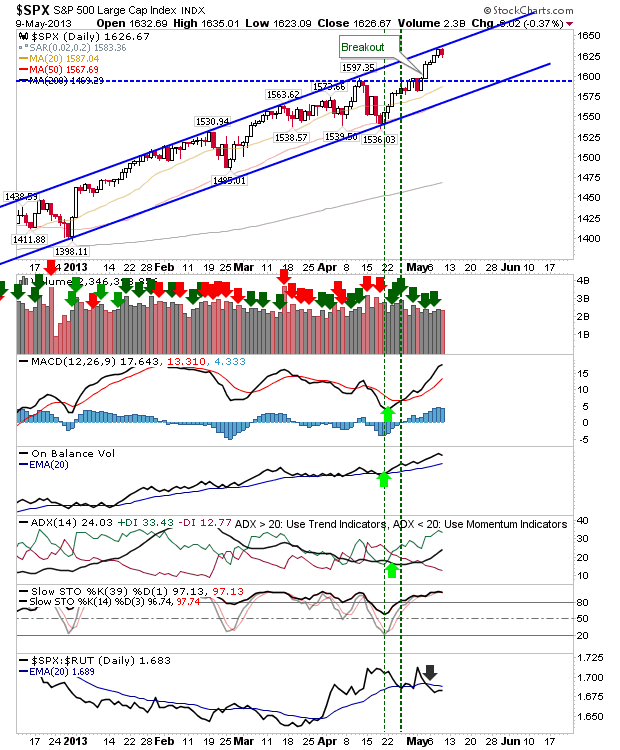 Technicals aren't pointing to any particular weakness, and only the S&P at resistance is suggesting tomorrow will see sellers make a run at things. So look to the S&P for leads (it could follow the Nasdaq and break resistance).